Stratford upon Avon Boat Club’s Senior Men’s squad started off the new Head season at a very wet Worcester Small Boats Head on Saturday. 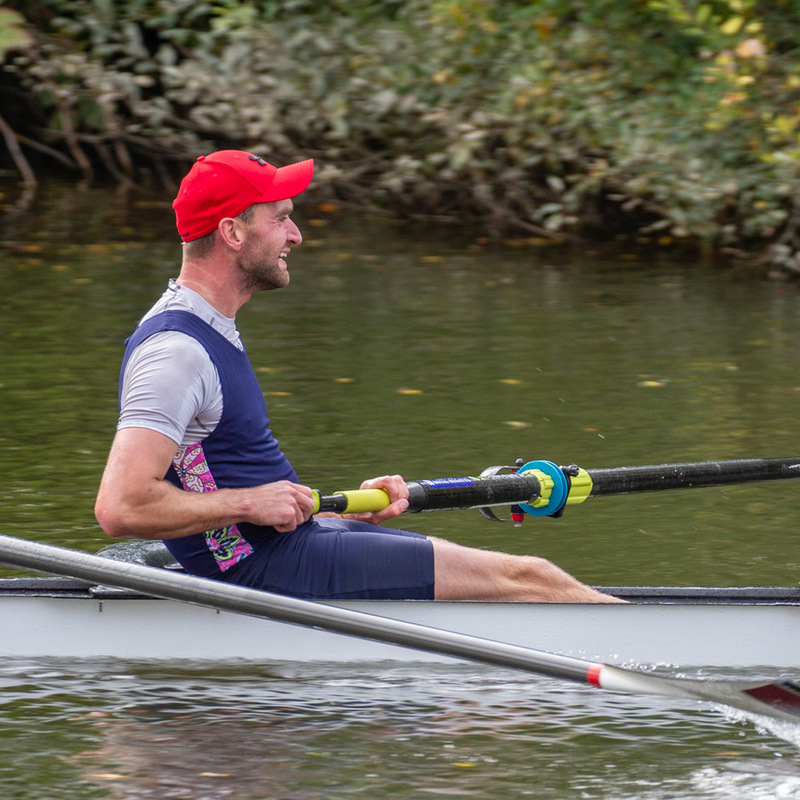 Over 200 boats were competing on the 4.5 kilometre stretch of the River Severn aiming to show off their early season pace, run over two divisions. In the morning division, Stratford’s Senior Men’s coxed four of Amie Jones , Mike Hourigan, Finn Sprackling, Ben Twiney and Patrick Hourigan had a very promising row winning their event and coming home as the quickest boat overall, beating rivals from all over the Midlands. 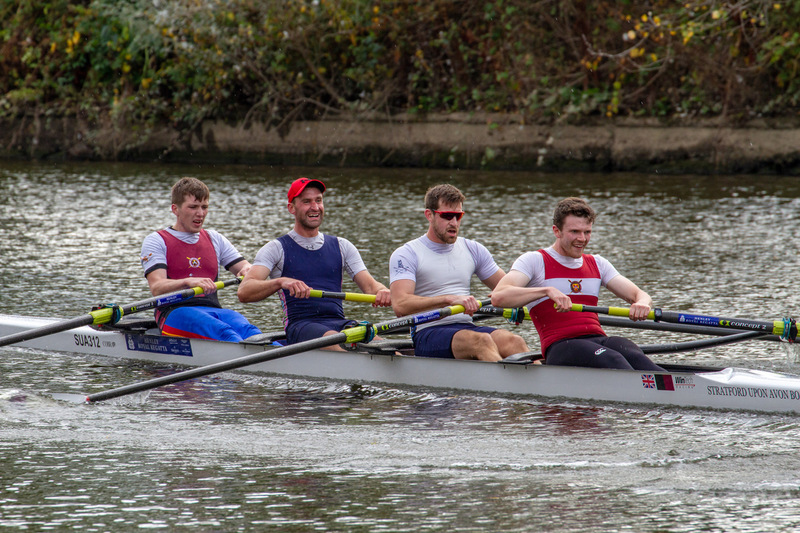 They were closely followed home by the Stratford coxless quad of Ed Lewry, Oli Smith, Max Marcus and Tom Coles who also won their event with something in hand, despite some slightly erratic steering. The morning was rounded off by a win for Vice Captain, Tom Marshall, in his singles race, especially pleasing as he was returning from a long term injury. Stratford only had one entry in the afternoon division – racing a coxless four against a strong Nottingham crew. 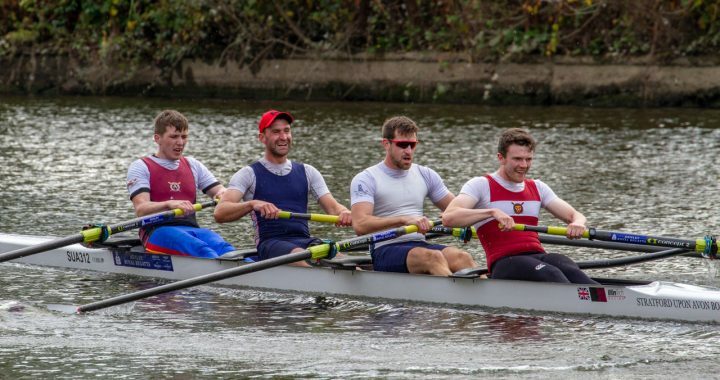 The Stratford crew of brothers Mike and Pat Hourigan, Tom Coles and Finn Sprackling lost by fourteen seconds to the Nottingham crew after fading in the second half of the race. Whilst their colleagues were battling it out on the River Severn, two Stratford Master rowers braved the worst of the weather on a rough River Thames. 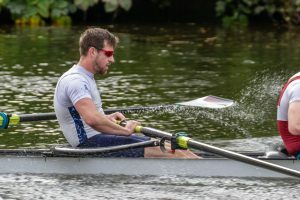 Sian Maher and Thomas Doherty braved the stormy conditions to take part in one of the main national head races of the year on Saturday on the famous River Thames in Central London. An extensive logistical operation saw the two rowers arrive with their boat at a stormy Putney Embankment to join a huge field of 470 entrants from all over the UK. 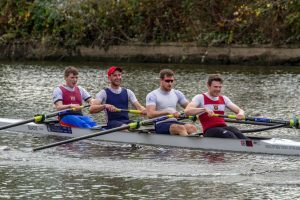 Conditions proved challenging from the start as the crews undertook a long row up to the starting area by Chiswick Bridge for the start of the 4.5km course in windy choppy waters and continual rain. For Sian experiencing her first small boat event it was a baptism of fire as all crews struggled with the conditions. With the race finally underway, there was no let-up in the weather conditions, Stratford opted for a conservative race plan and settled into a steady rhythm in the swell and wind. A good push at Barnes Bridge saw them up the pace as they found themselves in a side by side race with a Cambridge crew for the whole of the second half of the race. With both crews forgetting about the conditions and focusing on each other, an exciting tussle developed with both crews level for the remainder of the race. Finishing in a time of 17.54 whilst not fast enough to trouble the winners, it was a respectable time for an inexperienced Tideway crew. Posted in News and tagged Amie Jones, Ben Twiney, Bill Sullivan, Cambridge, Chiswick Bridge, Ed Lewry, Finn Sprackling, Fours Head, Gloucester Head, Lawrence Little, Max Marcus, Mike Hourigan, Oli Smith, Patrick Hourigan, Putney Embankment, River Severn, senior, Sian Maher, small boats head, squad, Stratford Herald, Stratford Observer, Thames, Thomas Doherty, Tideway, Tom Coles, Tom Marshall, Worcester.